Provides riders with up-to-the-minute information on the current location of their bus via the web. Learn more about how to use bus schedules, bus stop QR codes or TAP cards. Important innovation for Santa Clarita Transit and other L.A. County transit riders. With fast, reliable service, City of Santa Clarita Transit can take you just about anywhere you want to go. Passengers can travel with ease throughout the Santa Clarita Valley and to other neighboring cities. Our affordable Commuter Express service is the perfect way to avoid the stress of weekday driving and ride in comfort to your destination. Trip Planners can help you plan and enjoy the best possible ways to get to your destination with ease. 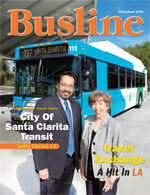 SCV Transit Featured in Busline Magazine! Click the image to the right to read how Santa Clarita Transit is making news. View and download the latest routes and schedules in PDF format. View all jobs available at MV Transit.